If you had to think consciously in order to move your body, you would be severely disabled. Even walking, which we consider to be no great feat, requires an intricate series of motions that your cerebrum would be utterly incapable of coordinating. The task of putting one foot in front of the other is controlled by the more primitive parts of your brain, the ones that have not changed much since the mammals and reptiles went their separate evolutionary ways. The thinking part of your brain limits itself to general directives such as "walk faster," or "don't step on her toes," rather than micromanaging every contraction and relaxation of the hundred or so muscles of your hips, legs, and feet. b / Simultaneous rotation and motion through space. Physics is all about the conscious understanding of motion, but we're obviously not immediately prepared to understand the most complicated types of motion. Instead, we'll use the divide-andconquer technique. We'll first classify the various types of motion, and then begin our campaign with an attack on the simplest cases. To make it clear what we are and are not ready to consider, we need to examine and define carefully what types of motion can exist. 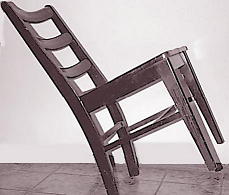 c / One person might say that the tipping chair was only rotating in a circle about its point of contact with the floor, but another could describe it as having both rotation and motion through space. A ballerina leaps into the air and spins around once before landing. We feel intuitively that her rigid-body motion while her feet are off the ground consists of two kinds of motion going on simultaneously: a rotation and a motion of her body as a whole through space, along an arc. It is not immediately obvious, however, what is the most useful way to define the distinction between rotation and motion through space. Imagine that you attempt to balance a chair and it falls over. One person might say that the only motion was a rotation about the chair's point of contact with the floor, but another might say that there was both rotation and motion down and to the side. 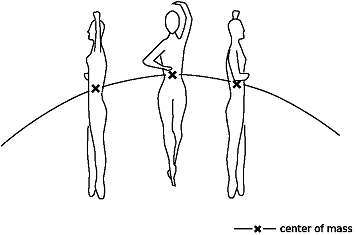 d / The leaping dancer's motion is complicated, but the motion of her center of mass is simple. It turns out that there is one particularly natural and useful way to make a clear definition, but it requires a brief digression. Every object has a balance point, referred to in physics as the center of mass. For a two-dimensional object such as a cardboard cutout, the center of mass is the point at which you could hang the object from a string and make it balance. In the case of the ballerina (who is likely to be three-dimensional unless her diet is particularly severe), it might be a point either inside or outside her body, depending on how she holds her arms. Even if it is not practical to attach a string to the balance point itself, the center of mass can be defined as shown in figure e.
e / No matter what point you hang the pear from, the string lines up with the pear's center of mass. 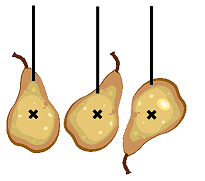 The center of mass can therefore be defined as the intersection of all the lines made by hanging the pear in this way. Note that the X in the figure should not be interpreted as implying that the center of mass is on the surface - it is actually inside the pear. Why is the center of mass concept relevant to the question of classifying rotational motion as opposed to motion through space? As illustrated in figures d and f, it turns out that the motion of an object's center of mass is nearly always far simpler than the motion of any other part of the object. The ballerina's body is a large object with a complex shape. 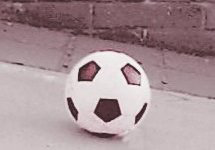 We might expect that her motion would be much more complicated than the motion of a small, simply-shaped object, say a marble, thrown up at the same angle as the angle at which she leapt. But it turns out that the motion of the ballerina's center of mass is exactly the same as the motion of the marble. That is, the motion of the center of mass is the same as the motion the ballerina would have if all her mass was concentrated at a point. By restricting our attention to the motion of the center of mass, we can therefore simplify things greatly. f / The same leaping dancer, viewed from above. Her center of mass traces a straight line, but a point away from her center of mass, such as her elbow, traces the much more complicated path shown by the dots. We can now replace the ambiguous idea of "motion as a whole through space" with the more useful and better defined concept of "center-of-mass motion." The motion of any rigid body can be cleanly split into rotation and center-of-mass motion. By this definition, the tipping chair does have both rotational and center-of-mass motion. Concentrating on the center of mass motion allows us to make a simplified model of the motion, as if a complicated object like a human body was just a marble or a point-like particle. Science really never deals with reality; it deals with models of reality. 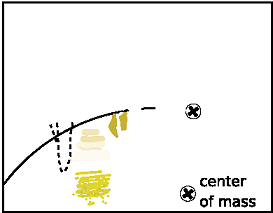 Note that the word "center" in "center of mass" is not meant to imply that the center of mass must lie at the geometrical center of an object. 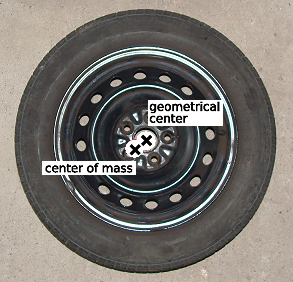 A car wheel that has not been balanced properly has a center of mass that does not coincide with its geometrical center. An object such as the human body does not even have an obvious geometrical center. 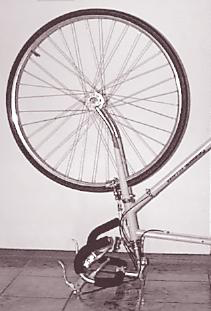 g / An improperly balanced wheel has a center of mass that is not at its geometric center. When you get a new tire, the mechanic clamps little weights to the rim to balance the wheel. It can be helpful to think of the center of mass as the average location of all the mass in the object. With this interpretation, we can see for example that raising your arms above your head raises your center of mass, since the higher position of the arms' mass raises the average. i / A fixed point on the dancer's body follows a trajectory that is flatter than what we expect, creating an illusion of flight. 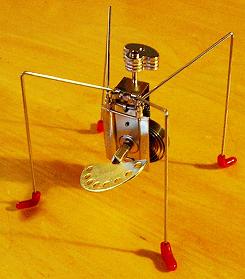 h / This toy was intentionally designed so that the mushroomshaped piece of metal on top would throw off the center of mass. When you wind it up, the mushroom spins, but the center of mass doesn't want to move, so the rest of the toy tends to counter the mushroom's motion, causing the whole thing to jump around. Ballerinas and professional basketball players can create an illusion of flying horizontally through the air because our brains intuitively expect them to have rigid-body motion, but the body does not stay rigid while executing a grand jete or a slam dunk. The legs are low at the beginning and end of the jump, but come up higher at the middle. Regardless of what the limbs do, the center of mass will follow the same arc, but the low position of the legs at the beginning and end means that the torso is higher compared to the center of mass, while in the middle of the jump it is lower compared to the center of mass. Our eye follows the motion of the torso and tries to interpret it as the center-of-mass motion of a rigid body. But since the torso follows a path that is flatter than we expect, this attempted interpretation fails, and we experience an illusion that the person is flying horizontally. The center of mass as an average. Another interesting example from the sports world is the high jump, in which the jumper's curved body passes over the bar, but the center of mass passes under the bar! Here the jumper lowers his legs and upper body at the peak of the jump in order to bring his waist higher compared to the center of mass. k / The high-jumper's body passes over the bar, but his center of mass passes under it. Photo by Dunia Young. Later in this course, we'll find that there are more fundamental reasons (based on Newton's laws of motion) why the center of mass behaves in such a simple way compared to the other parts of an object. We're also postponing any discussion of numerical methods for finding an object's center of mass. Until later in the course, we will only deal with the motion of objects' centers of mass. In addition to restricting our study of motion to center-of-mass motion, we will begin by considering only cases in which the center of mass moves along a straight line. This will include cases such as objects falling straight down, or a car that speeds up and slows down but does not turn. Note that even though we are not explicitly studying the more complex aspects of motion, we can still analyze the center-of-mass motion while ignoring other types of motion that might be occurring simultaneously . For instance, if a cat is falling out of a tree and is initially upside-down, it goes through a series of contortions that bring its feet under it. This is definitely not an example of rigidbody motion, but we can still analyze the motion of the cat's center of mass just as we would for a dropping rock. Self-Check Consider a person running, a person pedaling on a bicycle, a person coasting on a bicycle, and a person coasting on ice skates. In which cases is the center-of-mass motion one-dimensional? Which cases are examples of rigid-body motion?